Photos from the second annual Philly Women’s March. Jan. 20, 2018, 4:45 p.m.
Suzann Christine’s voice echoed out from the stage in front of the Art Museum steps Saturday morning. 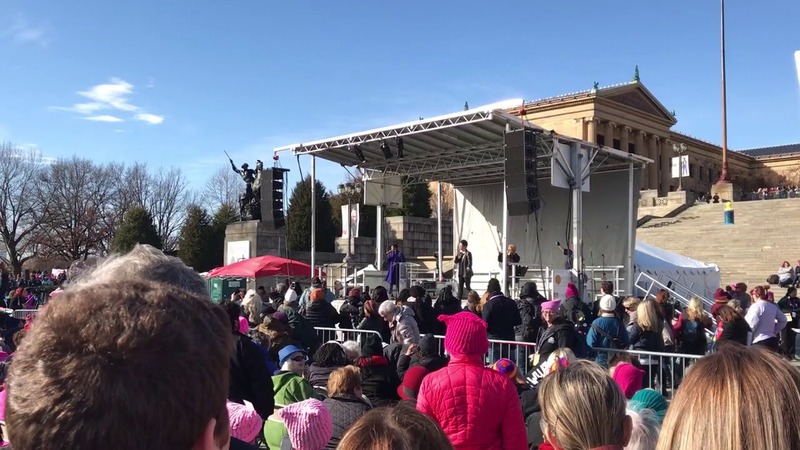 “We persist,” Christine said defiantly, inciting cheers from the tens of thousands of women (and many men) standing in the unusually warm January sun for the second annual Women’s March on Philadelphia. The clear skies over the Ben Franklin Parkway were a stark contrast from the dreary weather that met the inaugural Philly Women’s March on January 21, 2017, one day after President Donald Trump was inaugurated. Like last year, there were a good number of anti-Trump posters waved around Saturday. Attendees met in Logan Square early in the morning before making their way up the Parkway starting around 11 a.m. People then gathered at Eakins Oval where a rally was held. Among the thousands that marched — some unofficial estimates have put the crowd at more than 50,000 strong — there were a variety of reasons why each was in attendance. At the rally in front of the art museum, organizer Emily Cooper Morse delivered a speech. Cooper Morse was followed on stage by many others speakers, including Nedia Ralston, Governor Tom Wolf’s deputy chief of staff, and Salima Suswell, another march organizer. “I would march each and every day if I could,” Suswell said. Although concerns about police security may have caused some people to stay home — especially women of color — there were many who came out for the successful event. Here are 18 more photos that show the scene at this year’s Women’s March on Philadelphia.